Today is autumnal equinox, the first day of fall in the US. For many of us, that means cooler weather is on its way (if it hasn’t arrived already). So goodbye summer—it’s time for heartier fare. And if you need to warm up on a chilly day, there’s nothing better than soup. I particularly like ones that feature dried legumes or pulses. Like this great Lentil and Tomato Soup. You could serve this in small portions as a starter, but it cries out to be a meal in a bowl. Maybe pair it with some of that wonderful Beer Bread we posted about last week. Add small salad if you’re particularly hungry. And of course include a nice glass of wine (or a bottle of beer). I like to use ordinary brown lentils in this soup, although you could substitute other varieties. Cooking time may be a few minutes shorter or longer, depending on the type of lentils you choose. But no big deal. Lentils cook in a short time anyway (typically 30 to 40 minutes for brown lentils). So this soup is quick to make. If you still have ripe tomatoes from your home vegetable garden, you can use them in this soup. But canned tomatoes work quite well, and are more convenient for most of us. Thyme (fresh or dried) is delicious in this soup. And I usually add another herb too—fresh rosemary, in this case. (Avoid dried rosemary, which is flavor-challenged). Fresh basil would be great as well. This recipe takes about 15 minutes of prep time, plus another 40 or so minutes of simmering time. So you’ll have soup on the table in under an hour. The recipe as written yields a lot—about 4 quarts. So unless you’re feeding a crowd, you’ll have leftovers (although it’s easy to cut the recipe in half). This soup freezes quite well, so I always portion out leftovers into air-tight quart containers (a size that’s enough for 2 very hearty servings, or 3 less hearty ones) and freeze them. Frozen, this soup keeps well for up to 6 months. Pick through the lentils and remove any tiny stones or clumps of dirt that might be in the package. Place the lentils in a large bowl, add water, and allow them to soak as you proceed with the rest of the recipe. Peel the onions and mince (I like cubes of ¼ inch or a bit larger). You may also want to reserve a bit of red onion, if using, for garnish. Wash and peel the celery, and mince into cubes of about ¼ inch. Do the same for the carrots. Put a 6-quart (or larger) pot on the stove top, and turn burner to medium. Add olive oil when the pot is warm. When the olive oil is hot (it shimmers—this takes a few seconds) add the chopped onions, celery, carrots, and garlic. Add salt to season the vegetables, and sauté until the vegetables are soft but not browned (about 5 minutes). When the vegetables are soft, add the red pepper flakes (if using) and sauté for about 15 seconds. Add the tomatoes, and sauté for a minute or two (you don’t need to be exact about the timing of this step). While the tomatoes are sautéing, drain the lentils. Add them to the pot. Add 10 cups of water, along with the thyme and rosemary leaves. Bring to a simmer and add salt and pepper to taste. Set a timer for 30 minutes. At the 30-minute mark, test the lentils—they should just be getting soft and almost done. Add additional water if necessary so the soup is as liquidy as you like (the pasta will absorb some water). Add the pasta, stir to make sure it doesn’t settle on the bottom, and set a timer for 10 minutes. Grate the Parmesan cheese if you’re using it for garnish. When the timer goes off, taste the soup and adjust seasoning if necessary. Check to make sure the lentils are done (they should be; if not, simmer for another few minutes until they’re totally soft). Serve with a sprinkling of grated Parmesan cheese and/or a sprig of rosemary for garnish. Or garnish with a few diced red onion pieces. It’s probably easiest to make this soup with canned tomatoes, and throughout much of the year that’s your only real choice anyway. But if you have fresh, ripe tomatoes available, they’re great in this soup. You’ll need about 5 large (or 10 plum-sized) tomatoes, peeled. The easiest way to peel them is by blanching first in hot water. Just pop each tomato into a pot of boiling water for 30 seconds, then remove with tongs. The skin should peel off easily. Place the peeled tomatoes in a bowl of ice water to cool, then dice them (you can also deseed the tomatoes at this time if you want; I usually just leave the seeds in, though some people think they add bitterness). Not everyone has access to fresh rosemary, so you can skip that. But it has wonderful flavor and will grow on your windowsill during the winter, so you might consider buying a plant. If you’re using fresh basil in this recipe, I’d add it in Step 8 when you add the pasta. If you cook basil too long, much of its perfume dissipates. Ditalini is great in soups, but any small pasta shape (like orzo, or even elbow macaroni) will work. Or you could substitute rice. In that case, I’d cook the rice separately—it absorbs a lot of liquid, and takes longer to cook than pasta. BTW, if you make this soup ahead, stop at Step 8. Then when you reheat the soup, add the pasta and continue with the recipe. The pasta tends to expand over time, so if you prepare the soup with the pasta and the soup sits in the refrigerator, the pasta will absorb a lot of liquid. Grated Parmesan cheese makes a flavorful garnish (though none of the pictures accompanying this post show it). For looks, it’s hard to beat a small sprig of rosemary or a sprinkling of raw, diced red onion. You could also drizzle on a bit of extra virgin olive oil. You won’t see it, but you’ll sure taste it. “Soup, I love you!” said Mrs. Kitchen Riffs, spoon in the air. “Agreed,” I said between mouthfuls. “Excelente!” said Mrs K R.
How perfect to add small pasta to lentils! I eat a lot of lentil stew but it was always a one or the other choice with pasta. Gorgeous! Hi Paula, I love the combo of lentils (or other pulses and legumes) pasta. Makes a nice, tasty, hearty dish. Thanks for the comment. Oh my! I almost want to lick the screen. Love the combo of lentils with the pasta and tomatoes. I love the combo of lentils in soup! This looks so hearty and delicious!! Hi Lydia, this is incredibly good stuff! Alas, you can't really appreciate its flavor from licking the screen, though. ;-) Thanks for the comment. Hi Kiran, aren't lentils lovely? I love their flavor! Thanks for the comment. You are a very special cook. I would love to have a hot bowl. I too LOVE fall. And miss it but am grateful I felt a bit of it in the UK and Geneva this past week. The photos are GORGEOUS. Again!!!! Hi cquek, I'd love for you to have a bowl! Thanks so much for your comment. Hi Kitchen Butterfly, we're alternating between rather hot weather, and less hot. Truly cool weather is still a couple of weeks away in St. Louis, and I can't wait. Thanks for the kind words, and comment. Waht a hearty soup to welcome fall. This is always a great one. And that dried Hatch chile powder? Never tried it. We buy fresh and freeze them. But I am curious what you think. Green or red? And how's the flavor? I always thought I hated lentils until I made lentil soup at the beginning of this year and loved it. So comforting and healthy! Yes , it's time for comfort foods , I can hardly wait , I always keep a pot of soup on the back burner , I wish I could pull it off the screen , John , all your recipes leave me hungry :D thanks for sharing . Totally agree that dried Rosemary is flavor-challenged, plus it never seems to rehydrate properly. In our climate we're able to cut fresh rosemary year round which makes adding it to wonderful soup like this, quite ideal. 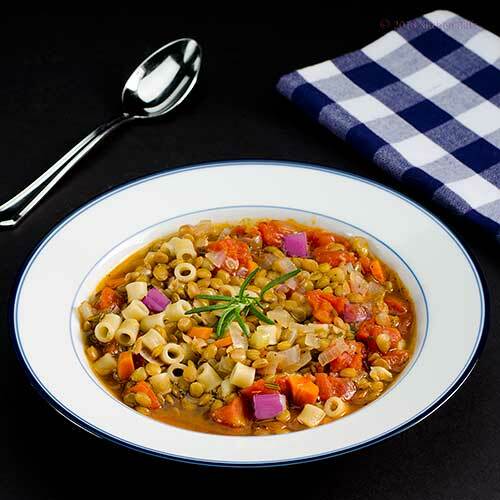 This is like a lentil minestrone - lots of flavors and textures. Several years ago a friend of mine taught me a great trick with pasta and soups. She cooks the pasta separately and adds it to the serving bowls, never to the soup. It works great and prevents the soggy pasta issue with the leftovers. Very nice soup John and perfect for our beautiful fall weather! Thanks! Hi Abbe, the dried Hatch chile is the ripe chilies - red - that have been dried and ground into powder. Both green and red are great, although I use them differently. The dried has a more "chili" type of flavor, IMO. Thanks for the comment. You're going to wonderful warming soups like this and all I can think about are salads and beach food. :) Isn't it great that we can share our seasons? Hi Laura, lentils have so much flavor! And soup is one of the best ways to use them, IMO. Thanks for the comment. Hi Nee, sorry to make you hungry! I love soup at this time of the year - one of those things we're always making. Thanks for the comment. Hi MJ, I actually sometimes do that too with the pasta - cook it separately. But when I'm lazy - as I was when I made this batch - I always include the pasta. I'm actually OK with it getting swollen and a bit soggy, but not everyone is. When we lived in Florida our rosemary never came indoor. Alas here I'll have to dig up some and bring it in when the weather gets colder. Thanks for the comment. Hi Maureen, that's one of the fun things about reading blogs in other parts of the world, specifically the southern hemisphere - you're always craving different things! I actually enjoy that a lot. ;-) Thanks for the comment. I adore lentils and this recipe is just perfect for the crisp fall weather we're getting right now. I am so ready for soup weather. Putting this on my list as soon as it gets coo. I love making and eating soup. This one sounds hearty and yummy. I have just started using lentils in my soups a couple of years ago and really like them. Hi Katherine, are lentils wonderful? And so is fall weather! I love it when it starts to get cold. Thanks for the comment. Hi Debra, I'm ready too! We've just starting to see cooler weather now, so lately there have been a lot of soups and chili at our house. Thanks for the comment. Hi Barbara, for me, a love of pasta! Can't get enough of that, and soup, too. Thanks for the comment. Hi Louise, the beer bread goes quite well with this. ;-) I love all of the small soup-friendly pasta shapes. But Ditalini is one of my faves, and pretty common. Thanks for the comment. Hi Julia, snow? You have to make this soup! ;-) Thanks for the comment. Hi Dawn, lentils add such a nice bass note to soups, don't they? Rich, too, in their own way. I love them! Thanks for the comment. I love soup weather, and Ry and I were just talking about how we should do more with lentils. So good for you and so affordable! Thank you for sharing. What a delicious and lovely way to end the weekend and start the week! Hi Monet, good point about how affordable lentils are - they're really cheap! A lotta nutrition for what they cost. And flavor that's out of this world! Thanks for the comment. What a healthy and hearty dish! I love having these warming dishes in the cooler weather. What a big bowl of comfort! I just want to curl up on the couch with this. Delicious John! This sounds SO good. A great warming, filling recipe and I wish I had some for my lunch today! This soup is beautiful and hearty. Just yesterday I was thinking it was finally time to bring out the soup. This would be a perfect choice. Great recipe! Our autumn weather has been here for a few weeks no. I always crave a hearty soup like yours during this time of the year. It looks perfect, thanks for sharing John. Hi Gourmet Getaways, isn't this nice? I so like hearty fare in cool weather too! Thanks for the comment. Hi Lizzy, it really is a nice recipe, and slurp-worthy. ;-) thanks for the comment. Hi Anne, big bowl of comfort is exactly what this is! Thanks for the comment. Hi Rosa, this really is my kind of soup, too. Thanks for the comment. Hi Kumar, cool weather + hearty food = wonderful combo, no? ;-) Thanks for the comment. Hi Caroline, make some tonight and you can have it for lunch tomorrow! ;-) Thanks for the comment. Hi Vicki, isn't it nice? We love soups, and this is the season. ;-) Thanks for the comment. I leave summer kicking and screaming, but this recipe reminds me that there are some good things about the cooler weather. 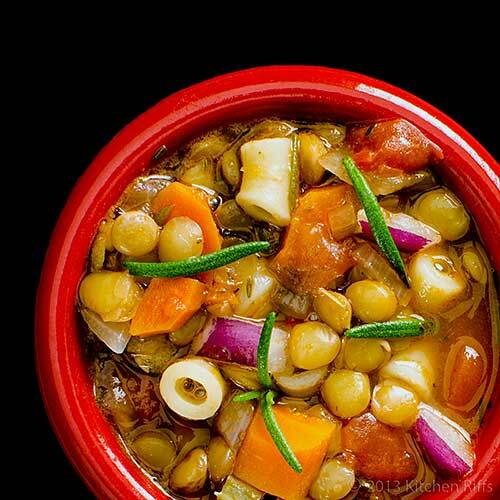 There is just something wholesome and healthy about vegetables and legumes stewed together. This will definitely be on my table at the first sign of an official cold snap which shouldn't be long. I just posted today about the autumnal equinox, as well! Great minds think alike! I love soups like this in the fall/winter! Hi Nancy, we're just getting into cooler weather now (and some days are still rather warm). But I agree with you on craving soup at this time of the year! Thanks for the comment. Hi Karen, I love summer but I love fall (and spring) too. I even like winter just as long as it's not too cold, or so snowy and icy that we can't get out and walk. Thanks for the comment. your lentil soup is just earthy and drfinitrly san seve me frm my tainy days lately! Hi Ashley, fall is a popular subject! ;-) And like you, I'm in love with soups like this at this time of the year. Thanks for the comment. Hi dentisttvchef, the brown lentils that are common in the US really take about 30 to 40 minutes to cook (much longer than that and they'll become mush), and don't really require presoaking. But there are loads of lentil varieties out there, and it sounds like the ones that are available to you take a lot longer to cook. Thanks for the comment. 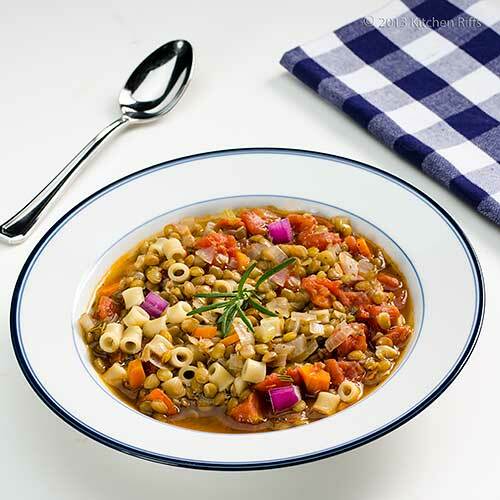 A nice hearty lentil soup perfect for this cool weather! John: I wish I had this wonderful, hearty soup in front of me...I'd have cleaned the plate!!!! Pinned! Hi Greg, it'll be a bit before you guys have cooler weather. ;-) But it's never too early to start with soup! Thanks for the comment. Hi Nik, we've certainly been eating a lot of it! And enjoying cooler weather, too - finally able to turn off the AC. ;-) Thanks for the comment. Hi Denise, this soup does lead to clean plates, I've noticed. ;-) Thanks for the pin and the comment. Hi Uru, might be a little too hearty for the warm weather you're about to experience, but we're certainly looking forward to it! :-) Thanks for the comment. Your soup sounds terrific John...I agree with you, Rosemary adds so much flavor. Fall is the sign of impending doom here in the new york city area.. but its definitely a gentle way to ease into the cool weather. Of the few things I like about cold weather, hearty lentil soups ought to be one of them! Your first close up shot is soo beautiful - I can see each ingredient distinctly. Hi Karen, doesn't rosemary have such terrific flavor? One of my faves. ;-) Thanks for the comment. Hi Alyssa, soup is so great for cooler weather. Although I like it so much I'll even eat it in the summer! Thanks for the comment. Hi Archana, fall weather in NYC certainly can be a bit gloomy at times, but soup always cures everything. ;-) Thanks for the comment. Oh My - this soup is comfort in a bowl! I am used to combining lentils and quinoa or rice - but have never tried pasta - awesome idea! Hi Shashi, isn't this nice? I often do the lentil and rice combo, but pasta is wonderful (and a classic Italian pairing). Thanks for the comment. Hi John, your comfort soup look delicious. Your recipe is very interesting and looking at the ingredients it's very flavorful. Thanks for sharing the notes. Love the combination of the soup. Would love a bowl of this on cool wintery night. My kids love this combination, they love pasta in it. Will surely try it. Hi Amelia, it's really a great soup! And although I'll eat it anytime, it's so nice when the weather turns cool. Thanks for the comment. Hi Asha, this is a really nice version of lentil soup. But they're all good! ;-) Thanks for the comment. John, this is perfect for the cold weather, indeed very hearty...what a beautiful and healthy meal! This soup looks so warm and hearty -- perfect for the cool weather! I love soup season. Being the opposite side of the world, we are now welcoming Spring!!! ... Whether it is Spring or autumn, a healthy hearty soup like yours is always good for comforting moments. I love, love lentil soup! The hubby...well, not so much. This is the sort of dish I'll eat all week for dinner...and your recipe looks phenomenal! Hi Juliana, isn't this nice? I love soup, and it's always best when the weather turns chilly! Thanks for the comment. Hi Amy, it's really wonderful stuff. I love soup season, too. ;-) Thanks for the comment. Hi Zoe, this soup works well in the spring too, particularly if you are still having some cool days. Thanks for the comment. Hi Charlie, I can imagine you're glad that warm weather has arrived! Whereas a lot of us are looking forward to cool weather (don't worry, I'll be quite ready for warm weather again in 5 months or so!). You're right that lentil soups often aren't that colorful, so I tried to include some nice ones in this. Thanks for the comment. Hi Liz, that means more soup for you! Always a good thing, IMO. ;-) Thanks for the comment. The first shot of this hearty moorish soup was enough for me to fall in love with it! Hi easyfoodsmith, I like that shot too! Thanks for the comment. I am ready for the chilly weather if I can enjoy some of this delicious-looking soup!! Lentil soup is one of my favourites! I like it with a lot of vegetables and pasta like you have here. I love all the colours in your soup, John. Gorgeous photos too. 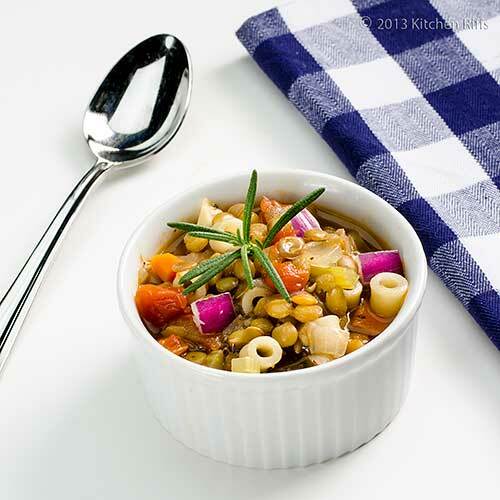 Hi Kristi, soup makes chilly weather almost fun, doesn't it? ;-) Thanks for the comment. Hi Nazneen, lentil soup is so much fun to make - you can add so many different ingredients to give each batch a totally different character. Thanks for your kind words, and comment. My husband has been craving stews and soups lately and I have to say I am not that creative with soups (I blame my college teacher for that) so I welcome your lentil version. We always have some lentil at home of course (India right!) so I ll be surely making this soon John. Hi Helene, you're lucky where you live - you have such a terrific variety of lentils to choose from! Enjoy the soup - I think it's pretty good. Thanks for the comment. Now that's a goodlooking bowl of soup. I'm in soup mode now that the weather is getting a little cooler. Love the combination of ingredients. Looks very light too! Thanks for sharing this one! Hi Bill, we're still getting some warm days, but it's definitely soup weather for us. In fact, we're having leftovers of this that we froze for dinner tonight! Thanks for the comment. This is definitely a meal in a bowl for sure, and totally cries out for a dip with beer bread! Hi Kristi, beer bread is so good with this! In fact we had some tonight when I heated up leftovers of this soup. ;-) Thanks for the comment. This is a very nice welcoming soup for the fall we have now (can't believe it!). For this kind of soup, I never added grated Parmesan cheese but that's something I should try next time. We always have a block of Parmesan but never thought of grating over this kind of soup! It's a must try! Hi Nami, Parmesan really adds a lot of flavor to a soup like this - a nice finishing touch. Definitely worth trying. Thanks for the comment. Isn't it so exciting that soup-season is fast approaching? I just had a big pot of lentils for dinner tonight, and I can still feel the warmth. I rarely have lentils with cheese, but the fresh parmesan sounds like a great idea. Thanks for this! Hi Irina, lentils and Parmesan is a wonderful combo, IMO. Worth trying, at least. Thanks for the comment. Hi Dana, we could eat it every day, too! I love lentils and dried beans. ;-) Thanks for the comment. I absolutely adore lentil vegetable soups and this one looks brilliant and very healthy! Hi Christine, it's a great soup! Wish we had some left - need to make another batch, I guess. ;-) Thanks for the comment. Yay, it's time for soup! I'm always a fan of lentil soup and this one sounds marvelous. Your top photo is particularly appealing! Hi Hannah, aren't lentil soups wonderful? I just love their flavor! Thanks for the comment.